LOCATION.--Lat 41`36'26", long 75`16'03", Wayne County, Hydrologic Unit 02040103, on right bank 180 ft upstream from unnamed tributary, 1,700 ft downstream from General Edgar Jadwin Reservoir, 2.1 mi north of Honesdale, and 2.6 mi upstream from mouth. PERIOD OF RECORD.--October 1943 to current year. Published as "at Dyberry" October 1943 to September 1959 and as "near Dyberry" October 1959 to September 1961. GAGE.--Water-stage recorder, crest-stage gage, heated tipping bucket precipitation gage and concrete control. Datum of gage is 970.70 ft above National Geodetic Vertical Datum of 1929. Prior to Oct. 1, 1957, non-recording gage at site 1.9 mi upstream at datum 13.70 ft higher. 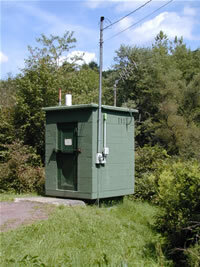 Satellite and landline telemetry at station. REMARKS.--Flow regulated since October 1959 by General Edgar Jadwin Reservoir (station 01429400) 1,700 ft upstream. Supplied by NWS:--Action stage-6.5 ft; Flood stage-7 ft; Moderate flood stage-8 ft; Major flood stage-9 ft.